The New York Liberty welcomed the undefeated WNBA Champions Minnesota Lynx and their dynamic duo of Maya Moore and Seimone Augustus. Tina Charles looked to lead the Liberty to a victory and end the team’s two game skid. The Lynx have not had much success at MSG they lost their last game and lost both games to the Liberty last season. The Liberty looked to continue this trend and get a victory against one of the elite teams in the league. The Lynx went into last night’s contest just like how they finished their championship season, blazing hot and looking to remain undefeated. Sugar Rodgers gave the Liberty the early lead as she hit a 3-pointer on the home team’s second possession of the game. Maya Moore then answered for the visiting defending champs. Tanisha Wright got the defensive assignment on Moore early in the game. Both teams began the game with some sloppy play. The score was 7 apiece with a little over 6 minutes left in the first quarter. Seimone Augustus hit two consecutive field goals as the Lynx settled down on offense and never looked back. After the first Liberty timeout, Swin Cash entered the line-up for the home team. Cash immediately went after Augustus who picked up an early foul. The Lynx extended their lead to 11 after a transition jump shot by all star Maya Moore with a little over 2 minutes left in the opening period. At that point the score was 20-9. The Lynx remained hot and gained a 17-point advantage. Moore had 11-points in the first quarter as the crowd was wowed by her acrobatic shots toward the end of the period. At the end of the first the score was 28-11 in favor of the visiting defending champs. The Liberty just did not seem in sync offensively or defensively to begin the game. The leagues leading scorer, Tina Charles struggled mightily in the first period , shooting 1-6 from the floor. In the second period the Liberty came alive as they picked up the tempo and played aggressively on defense. Tina Charles and Sugar Rodgers became a little more active. The Liberty pulled to within 5 with a little over 4 minutes to go, however the Lynx answered with Augustus and Renee Montgomery who seemed like she could not miss in the first half. The others for the Lynx were outplaying the others for the Liberty as they extended their lead again after a quick run by the Liberty. The Lynx led 46-30 at the half. The defending champs just played an elite brand of basketball snd looked unstoppable . The story of this game was the play of the Lynx’s superstars and the inability of the Liberty to secure the basketball. They had 19 turnovers, which is a recipe for disaster. 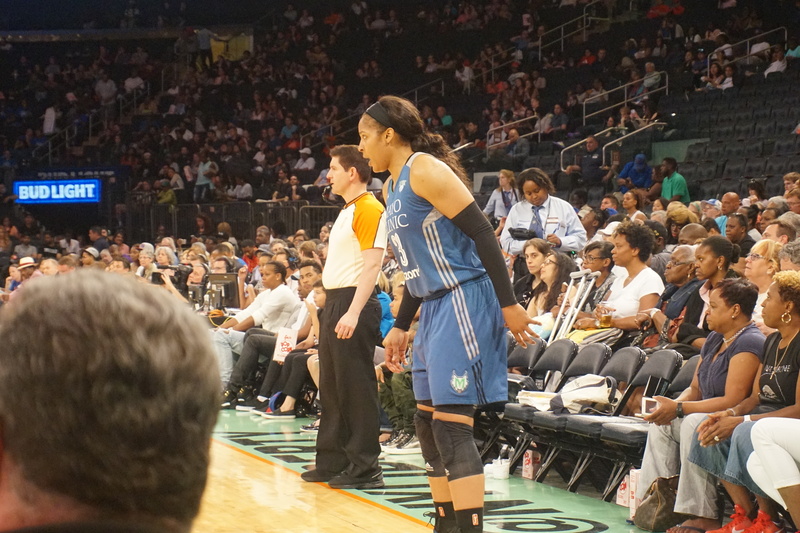 Maya Moore was electric and lit up the court and the crowd with her play. She showed why she is an elite player and arguably the best player in the WNBA. She scored at will on many of her possessions and seemed to hit every timely shot as the Liberty attempted to make their comeback. She finished the night with 25-points 6 rebounds and 3 assists. Cleary an early MVP favorite Maya dominated this game and gave her teammates confidence throughout. Whenever they needed a bucket Maya answered. Maya only 5 years into her professional career is not a stranger to winning. High School, College, WNBA and the olympics. How does she stay motivated? As she put it, “ Great players and great coaches… and we want to do everything we can while we are together.” Maya also expressed her gratitude towards some of her older teammates whom she acknowledged would not be around forever while she plays for the Lynx and the WNBA so she cherishes her time with them. Seimone Augustus is in her 10th WNBA season and has not had an Augustus like start to the season. A career 18ppg player she has started the season off a little slowly but as the season progresses she should return to the scorer that we know her to be. The Liberty made a run late to pull within 9-points after a layup by Tanisha Wright. The Lynx became content taking contested jump shots in the final period. The home team pulled to within 5 with 2 minutes left in the game, the crowd was back into the game however they would get no closer and fall to the defending champions 79-69. The Liberty’s next game is this Friday (June 3rd 2016) as they take on Tamika Catchings and the Indiana Fever.